Happy Mother's Day! See that pretty flower in my photo? It is from the beautiful flowers Mike, Jody, Zachary and Nicholas sent me for Mother's Day. It is absolutely gorgeous! But that's not the only one that was in the bouquet. This is the one I rescued as it was drooping over and had a bent stem but I knew it would revive if I put it in its own little vase. The full bouquet is lovely and I'll show you a picture of it once all of the blooms are open. It has several more lilies like the one below and some purple flowers that are just opening up and aren't quite ready to reveal their true identities. Along with the flowers, came a small box of chocolates. It worked perfect for this week's Friday Mashup Challenge. We were to create a that was recycled or upclycled or create a project for Mother's Day or put them together and mash it up! I decided to upcycle the candy box and make a boxed set of 3 x 3 cards. 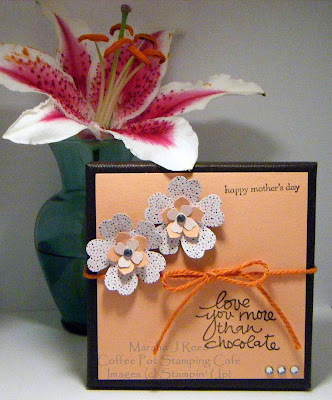 The cards are made from Crisp Cantaloupe card stock layered with the same little dotted patterned paper as the bottom layer of the flowers. Since there are no chocolates in the box, I thought the sentiment from the Lovely Amazing You stamp set was most fitting. Stamp Sets: Lovely Amazing You, Teeny Tiny Wishes; Ink: Early Espresso; Card Stock: Crisp Cantaloupe, Stacked with Love Designer Series Paper Stack; Accessories & Tools: Pansy Punch, Petite Petals Punch, Itty Bitty Accents Punch Pack, Tangelo Twist Thick Baker's Twine, Rhinestone Basic Jewels, Glue Dots, SNAIL Adhesive, Stampin' Trimmer. All Stampin' Up!® product unless otherwise noted. Here is how the way the box and the flowers looked on day one. 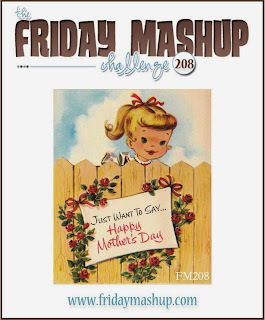 For all the challenge details and to play along, visit The Friday Mashup! Hi Marsha, what a wonderful idea to upcycle that chocolate box. 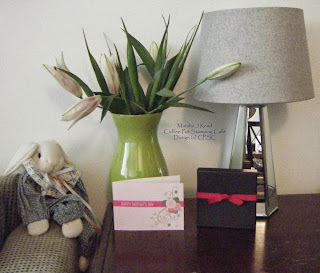 Love the beautiful lily you show with your card. I can see why you wanted to save it. It looks as if you've used the lily as inspiration for some of your colours as well. And the sentiment? Perfect, especially since the box began its life filled with chocolates. Thanks for joining us this week for the Friday Mashup. What a great idea to recycle the box the chocolates came in! The Crisp Cantaloupe was a lovely choice! Your flower is also beautiful, I love lilies!